Want to watch a bit of TV while on the road? Unless you are planning on using streaming services over the web, you have three choices: cable, satellite, or antenna. What Types Of TV Antennas Are There? Should I Get An HDTV Antenna Or A Satellite Antenna? Can I Watch TV While Driving? How Do I Find Local TV Stations? The Winegard RVW-395 Sensar IV antenna is your standard, roof mounted RV antenna. This antenna is a great go-to option if you have an older camper, and need to make some simple upgrades. While other antenna options may not work well as a replacement for an existing antenna, the Winegard Sensar IV is a quality choice for replacement or upgrade. You aren’t going to get a ton of extras with this antenna, but that shouldn’t steer you away from considering it as an option for your RV. This simply styled, and more traditional looking antenna is powerhouse when it comes to finding and tuning in channels. You’ll get all of your favorite stations, and even some that you might not expect. The Winegard Sensar IV is an amplified antenna, so it picks up VHF and UHF programming within a 55 mile radius and can also receive SD and HD broadcast channels. It’s durable and practical for mounting on the roof of your RV or camper. This antenna can easily be installed to existing antenna mounts, and raises and lowers using the crank inside of your camper. When traveling, this antenna sits just inches from the roof of your camper, protecting it from wind and debris and reducing wind resistance. This antenna is about a simple as it comes. You aren’t going to get a bunch of bells and whistles if you buy this one. It does have a few nice in-box extras. Signal amplifier, to help you get more channels and a clearer signal. Plenty of cable for easy installation. All necessary interior and exterior mounting hardware and instructions. Online and telephone customer support. This antenna may not offer as many cool features, but it really gives a lot of bang for your buck. If you want all the bells and whistles, the King Jack OA8300 antenna may not be for you, but if you are looking for a sleek, simple antenna that will increase the number of channels you can watch, gives you crisp image quality, and doesn’t break the bank, King Jack is a great choice. This model is our top pick, not only because it offers great features and superb quality, but because it gives all of that at a really spectacular price. King RV antennas have been around for two decades — long enough that the brand really knows how to do it right. Users seem to really like the King Jack OA8300 antenna as well; the internet is practically bursting with positive reviews. Though this antenna model is not feature heavy, it does offer a few extras. Here are some special features that the King OA8300 offers. The Winegard RV antenna really shines in two areas: the omnidirectional capabilities and the warranty that comes with the product. If you don’t mind spending a little extra money and are looking for an antenna that has a range of up to 35 miles, doesn’t need to be adjusted to find a signal, and is protected for 5 years by warranty, the Winegard antenna is a perfect choice. It may not come with quite as many stellar reviews, but the Winegard RS-3000 RoadStar is still a great choice. Winegard has been in the business of making antennas since 1954 and ties closely with King as a top brand. The Winegard does have a few special features that make it stand out. Here is a short list of some of the more notable ones. Though the Antop UFO antenna did not receive as high of ratings as some of our other picks, we believe it is still a strong contender. It offers a lot of neat features that are tailored to reducing interference and noise and comes at a pretty reasonable price. If you are on a tight budget and looking for an antenna that offers something extra, or want an antenna that has an installation option that doesn’t involve drilling holes in your roof, then check out the Antop UFO AT-416B. Runner-up number one, the Antop UFO is a strong option for several reasons. For one, it has a handful of unique features not offered by other models on this list. It also comes at a reasonable price — a little less than ten dollars more than the King Jack antenna. The antenna is also unique in that it can be installed via a clamp, thus eliminating the need to drill holes in the roof of your RV. The extra features are really where this model shines. It comes with a lot of them, and most are designed to help improve reception or reduce interference. Here is a list of some of the extra features the Antop UFO offers. 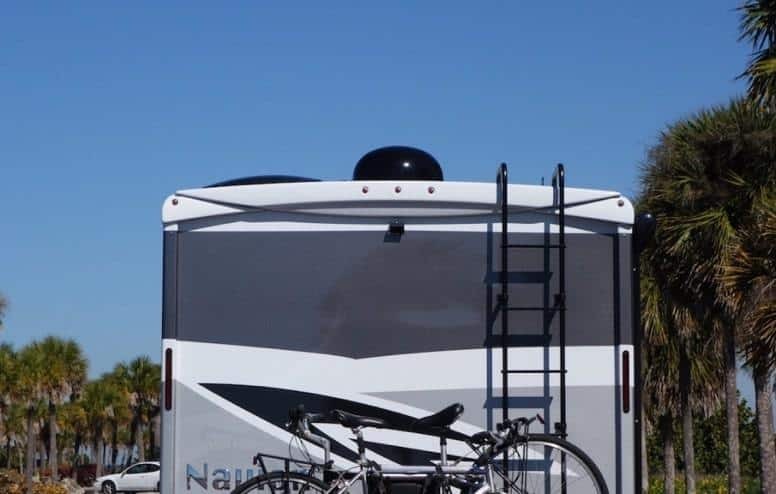 The features the 1byone RV antenna offers, combined with its durability, sleek design, and easy installation makes it a strong competitor, but there are probably better options if you are looking for something less expensive. Even so, when compared to some of the other antennas out there, the 1byone RV antenna really isn’t that unaffordable. When making your choice, it comes down to balancing the price against its special features, and deciding which is most important to you. All things considered, this antenna deserves its spot on our list. The biggest benefit to the 1byone Amplified RV Antenna is its advertised range — a whopping 70 miles. This is over twice the range of any of the other antennas we have reviewed for this article. The 1byone RV antenna comes with several snazzy features made to increase durability and performance. Here are a few of our favorites. An RV TV antenna is a great option for staying up-to-date on all your favorite shows because it is easy to set up and free to use. An antenna will allow you to tap into local broadcast channels like NBC, FOX, ABC, and CBS. You can place it on your dash or roof, put up your feet, and enjoy a bit of R&R — for the most part in full HD. There’re a lot of choices out there, and when it comes to choosing the best HDTV antenna for your RV, the pickings aren’t any slimmer. That’s why we’ve done the hard part for you. In this article we will walk you through the different points you will need to consider before purchasing your next (or first) RV antenna. To make things even easier, we also took the time to hand-pick some of our personal favorites. So sit back, relax, and enjoy the tour. Your television screen is about to get a whole lot crisper. Want more information before you make your choice? Read on for our complete guide of considerations you should be making when looking for an RV antenna to complete your vacation set-up. There’s no need to be an expert, but by the time you have finished with our succinct guide, you just might be. TV antenna types can be divided into two general categories: HDTV and satellite, and indoor or outdoor. We will discuss each in depth so you can decide what is best for you. These antennas pull in local broadcast channels and route them to your TV by tapping into the Ultra High Frequency (UHF) band. They can typically pull in broadcasts up to 50 miles away and give you a cleaner, crisper image than satellite or cable subscriptions. This is because you are receiving the UHF signals uncompressed and directly from the broadcast tower. Over-the-air broadcasts are free, so watching them with an HDTV antenna won’t cost you a dime. At its base, a satellite dish is simply an antenna that is designed to focus on a particular broadcast source. Watching TV through satellite, however, requires going through a provider who charges a fee for their services. On top of that, the feed you receive through a satellite dish is compressed, which means you lose some image quality. Satellite offers more channels than both HDTV antennas and cable, some of which are unique and can’t be found elsewhere. 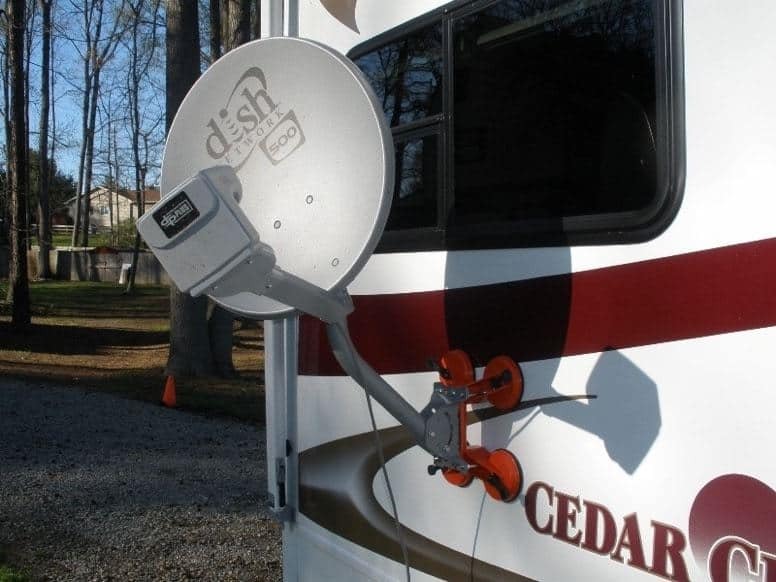 An indoor mounted RV HDTV antenna is just what it sounds like — an antenna that is mounted inside of your RV. 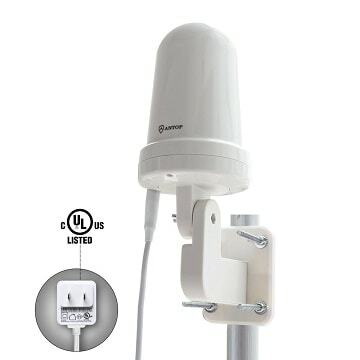 This antenna can be mounted just about anywhere. Typical locations include your dash and on a table-top where it will be out of the way. An outdoor mounted antenna is one that mounts on the outside of your RV. The roof is the best location for mounting, but these antennas can also be mounted on the sides or the bumpers of your RV. They are typically made of aluminum and plastic. Whether you choose an HDTV antenna or a satellite antenna really comes down to your needs. Before choosing an HDTV or satellite antenna, ask yourself what is most important to you. Are you looking for a budget-friendly way to watch TV while on the road? Do you have a show that you’d rather not miss that can only be watched on satellite? These two considerations will, most likely, be the deciding factor on whether you decide to go with an HDTV antenna or satellite. For the majority of people, HDTV antennas are the way to go. They offer better image quality, and you really can’t beat the price. If you are a TV junkie, however, and absolutely need to watch the next episode of your favorite show, then satellite may just be for you. Price: HDTV antennas, as we have already mentioned, are practically free. They allow you to watch TV without paying for a subscription. On top of this, they are generally much cheaper to purchase than satellite antennas. An average HDTV antenna runs between $9 and $100 while satellite antennas generally run between $100 and $1,000. Local programs: If you are in the range of a broadcast tower, the local programs that you can receive with an HDTV antenna offer almost everything you need. You can watch FOX, ABC, NBC, The CW, CBS, and PBS. Most broadcast towers also offer subchannels. Watching local channels can even be a fun part of your vacation experience because they will help you get a feel for the flavor of the region you are traveling in. Easy installation and maintenance: HDTV antennas are super easy to install. All outdoor installation requires is drilling a couple holes, fitting some pieces together, hooking up your coax cable, and attaching everything with a handful of screws. Indoor installation is even easier. In most cases, indoor installation doesn’t require more than some basic assembly and placing your antenna on a level surface. Maintenance is simple as well. For outdoor mounted antennas, you will need to spray some silicone on any moving parts for lubrication. That’s it. Adding a booster: You can easily add a signal booster to almost any RV antenna. Signal boosters do just as their name describes — they boost your signal. These boosters are a lifesaver in more remote areas. They run off of electricity and are located in the vicinity of your TV. Your coax cable will run from your TV to the signal booster, and then on to your antenna. Watching TV while driving is possible but difficult. It depends on what sort of system you have set-up and where you will be driving. If you have ever listened to the radio while driving through the mountains, you will have already experienced the biggest problem you may face watching TV while on the road — reception. Since an antenna relies solely on what it receives from a broadcast tower to give you TV, it makes sense that if you are out of range of one of these towers, you won’t be able to watch anything. Rural or remote areas are likely culprits for a spotty reception, as are hilly or mountainous regions. Another issue you may have when attempting to watch TV on the road only arises if your antenna is mounted outdoors, and needs to be put down while driving. Leaving your antenna up can be problematic — driving under a tree or bridge could put in the market for a new one — but if you put it down, you will encounter the same problem as before. If watching TV while driving is important to you, look for an antenna that doesn’t need to be put down, or go with an indoor version and secure it with tape or wedge it between immobile objects when you hit the road. As with most things these days, there’s an app for that. In this case, there’s several. If you are on an iPhone, try TV Towers U.S.A . If you are on Android, go with TV Antenna Helper. Both of these apps will give you the locations of nearby broadcast towers and tell you which direction to point your antenna for optimal reception. TV Antenna Helper has several features including a compass to show signal headings and a live, interactive map with the locations of nearby signals. It also sorts the signals from strongest to weakest. TV Towers U.S.A. features a coverage map for each broadcast station, as well as the number of channels and subchannels each station offers. If you’d rather try a more old-fashioned approach, set up your antenna when you’ve parked for the night and scan for channels on your TV. If nothing comes up, give your antenna a quarter turn, and scan again. Repeat this process until you get a signal. When you are planning on buying an RV antenna, there are certain features that you should be aware of. Knowing these features and comparing them in different models, plus thinking about your must-haves, will help you in making any buying decisions. Consider what kind of trips you are planning to take. Where will you be traveling? Will you be wanting to watch TV while on the road? Is price more important to you, or reliability? Taking factors like these into account will be important when you inevitably need to make compromises for one feature over another. Here are some features to be on the lookout for. It will be helpful to write down the specs of each model in a notebook, or somewhere similar, to use as a reference guide for when you are making comparisons later. The range of an RV antenna can vary drastically from one model to the next. Around 25 miles is average, but some antennas have a range of 55 miles or more. Keep in mind that a wider range will generally cost you, and think on whether you will be in areas that will require the extra mileage. As we discussed earlier in this article, there are HDTV antennas and satellite antennas. Taking the pros and cons into consideration, you should be able to narrow down which will work best for you. Is ease of use and installation most important to you, or are you more concerned with picking up the best signal you possibly can? As we discussed above, HDTV antennas can be mounted indoors or outdoors. Which you prefer will depend on your own personal circumstances. Does the model you are considering have a 3G or 4G filter? 3G and 4G filters block 3G and 4G wireless signals to ensure that you get noise free reception. Indoor antennas can be set on any flat surface, though some indoor antennas are made to attach to a wall or window, usually by way of a provided suction cup. Outdoor antennas can be mounted, as we stated earlier in this article, on your RV’s roof, sides, or bumper. Some antennas can also be mounted on a tripod and set up outside, next to your RV. For an outdoor antenna, roof mounting is the preferred method. Mounting your antenna on the roof makes full use of the benefits of outdoor installation by offering the least amount of interference with the UHF signal. Indoor antennas work best when placed on or near a window, for the same reason. 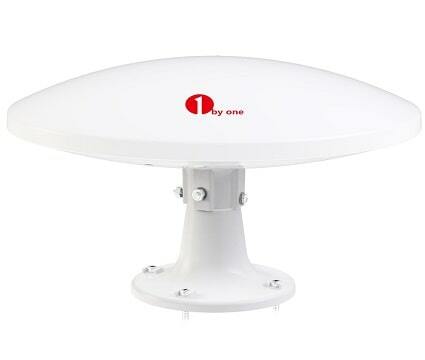 The installation will vary from model to model and depend on where you will be mounting your antenna. There are, however, several basic steps that most antenna models will follow. 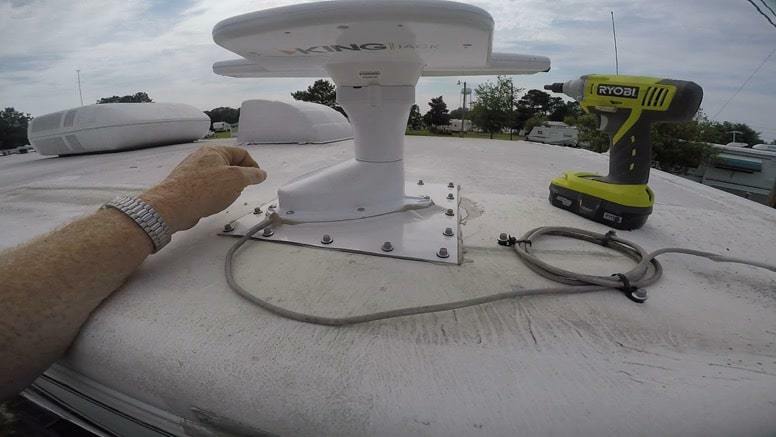 Below, we will describe the basic steps for mounting an outdoor antenna on the roof of your RV. Make sure you read through the owner’s manual of your new antenna for more specific instructions before you begin. Determine the best spot to place your antenna. Keep in mind where your television is located inside your RV because you will be running a cable through the roof to your television. Many manufacturers recommend placing your antenna next to your refrigerator vent. Drill two holes in the roof of your RV, making sure they are straight. One of these holes will be a half inch hole to run your coax cable through. The other hole will be where you are mounting the antenna itself. This hole is generally around half an inch as well, but it really depends on the model you are mounting. The exact size of the hole you will need to drill will be listed in the owner’s manual for your antenna. Clear out the insulation from the holes you have drilled. Run your coax cable from the interior of your RV, through its hole in the roof to the exterior and attach it to your antenna. Make sure to hand-tighten only. With the coax cable in place, slide the drive shaft of your antenna into its hole. The methods for attaching the antenna to your roof will vary depending on the model of antenna you have. In many cases, this will involve drilling 3 to 4 holes and attaching a mounting plate to the roof with screws. A ceiling plate will secure your antenna from the inside. Seal off all holes, including the coax channel and mount rim with a weather sealant to prevent leaks. Once you have your antenna mounted, the next step is to connect it to your TV. You do this by connecting the coax cable to the appropriate port. Turn off or unplug your TV. Find the “antenna in” input on your TV. For most TVs, this input will be on the back, but some will have it on the side, or even the front. You are looking for something that looks like a cylinder with a hole in the middle. Take the cable end that is not attached to your antenna, and plug it into the input you have identified. Use your fingers to tighten the connector. Turn your TV back on. You are now ready to scan for channels and relax! There are a handful of strategies and tools you can use to boost your signal. Boosting your signal will give you a clearer picture and allow you to watch TV in more remote locations. 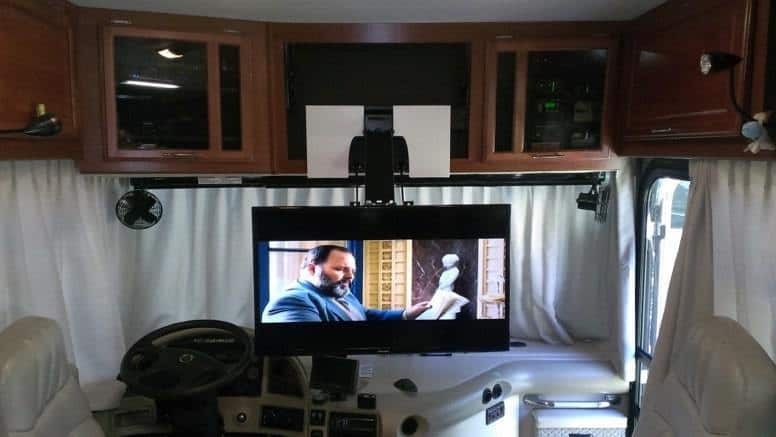 If the image quality on your 12 volt RV TV is grainy or you are having trouble picking up channels at all, make sure you try a few of these tips. Your problem may be easier to fix than you think. Even the smallest adjustment can make a world of difference. For HD quality images or any picture at all, you really need to be taking full advantage of the signal your antenna can receive. If your antenna is not properly aligned, grainy images will occur. Try using one of the apps we mentioned above, or purchase a signal strength meter. Either of these tools will help you determine where the strongest signal is coming from so you can adjust your antenna accordingly. A high-quality coax cable will help minimize signal loss. When purchasing a cable, look for an RG-6 coaxial cable. If you are using an old cable, check to make sure it is not frayed or ripped. This can also cause signal loss. As they say, location is key. Where you park your RV can change a lot about what kind of signal you can receive. For maximum signal strength, try parking on high ground. Parking in an area surrounded by tall trees, high buildings, or in valleys can also affect your signal for the worse. Likewise, stopping in hilly or mountainous areas can also cause signal problems. As we mentioned earlier, signal boosters boost your signal. These devices connect to your antenna via the coaxial cable. The coax cable then goes from the signal booster to your TV. Some RVs already have signal boosters installed in their system. If you have an older RV, consider getting a new signal booster, as newer models work better than older ones. Another thing to remember is that the signal booster does not work automatically. It is electronic and has to be turned on. There should be a small button and a light on your booster. If the light is not on, your signal booster is not turned on and isn’t doing its job. Keep in mind that the signal booster does use electricity. Remember to turn it off when you are done, otherwise, you could be facing a dead battery in the morning. Each of the four RV antennas we’ve recommended is sure to serve you well, but there are plenty of other options out there. If you like to compare your options, roll up your sleeves and let this guide be the starting block towards discovering your perfect solution. If you are feeling a bit overwhelmed, our number one pick, the Winegard Sensar IV won’t disappoint. Purchasing the right RV antenna really comes down to personal preference, as well as how you are planning on using it. Don’t forget to take all your trip details into account and consider how important TV is to you during your RV vacation. HDTV RV antennas are a great option for anyone who is looking to benefit from free, over-the-air broadcasts and enjoy a bit of local TV. Having access to television during your trip will help your vacation feel a little less “rustic” and a bit more like home. What do you think of our guide? Have we left anything out? Let us know in the comments below what your favorite HDTV RV antenna is, or chime in if you’ve had experience with any of our favorites. Whether you are an experienced RVer with some wisdom to impart or a newbie with questions, we’d love to hear from you. Even though one of your photos shows the Winegard Sensar IV you make no mention of it. Many people consider the Sensar IV the best RV antenna. Its best trait is the ability to receive VHF channels well. The antennas mentioned are too small for good VHF reception. About 25% of the TV stations in the US are now broadcasting on the VHF band so good VHF reception is important. Hey Tom, thanks for stopping by and for leaving a comment. I’ll definitely look into the Sensar IV and update the content accordingly.